Charlotte had her lung perfusion on Monday. The lung perfusion is an imaging test that uses a contrast dye to track the how her blood is pumping from her heart through her lungs. It measures, as I understand it, both velocity and concentration. Drs. Gossett and Young will use the readings from this test to determine what to look for with the cardiac catheterization and, after that, as part of a totality of evidence from which to decide next steps in general. The picture looks like uncharted stars on a night sky. Dr. Jarrod Green, the radiology fellow, explained that they would create mathematical measurements to understand the volume and velocity of blood pumping to her arteries. Jamie, the nuclear medicine technologist, explained that once the photos were all taken, she would center and arrange them so that each showed the lungs in the identical place in the image, which would also match up to Charlotte’s other lung perfusion tests. The idea is not only to get a picture of current conditions, but also to tell a story and see how today’s picture fits in. We scheduled the test for first thing in the morning with the intention that Charlotte would go to school afterward. For a week leading up to the test, Charlotte was quite nervous. She swung between asking a lot of questions and asking me not to mention it. But, yesterday morning, she got up, ate breakfast, and went chatting to the car like it was any other day. I was quite struck that she had few “game day” jitters, to be honest. We arrived at Lurie Children’s at about 8:10 for our 8:30 appointment. 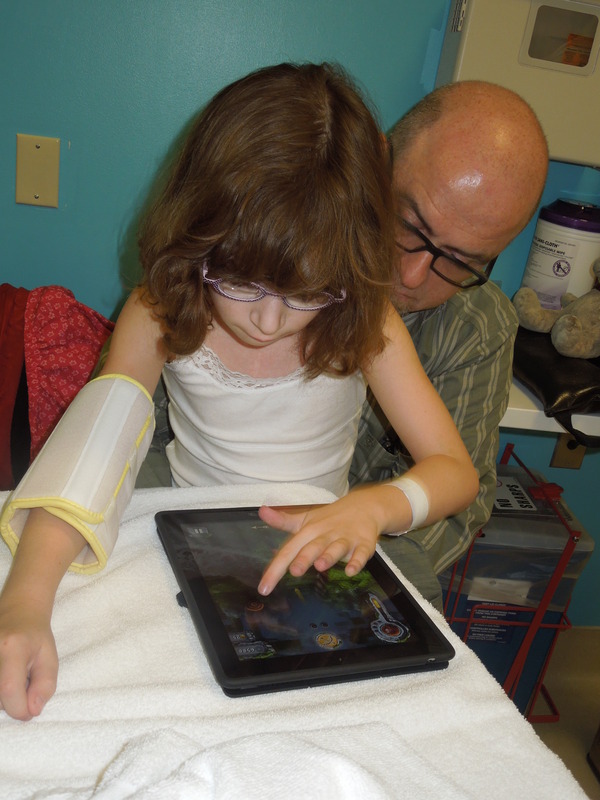 We were taken back to the imaging lab within minutes and the whole process started early. 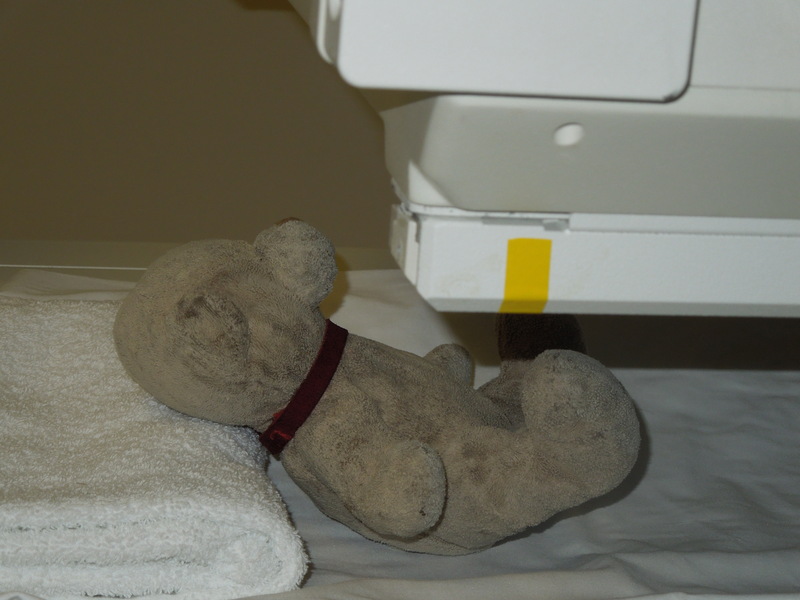 First, Charlotte had to be weighed so the nuclear medicine lab could concoct the dye. 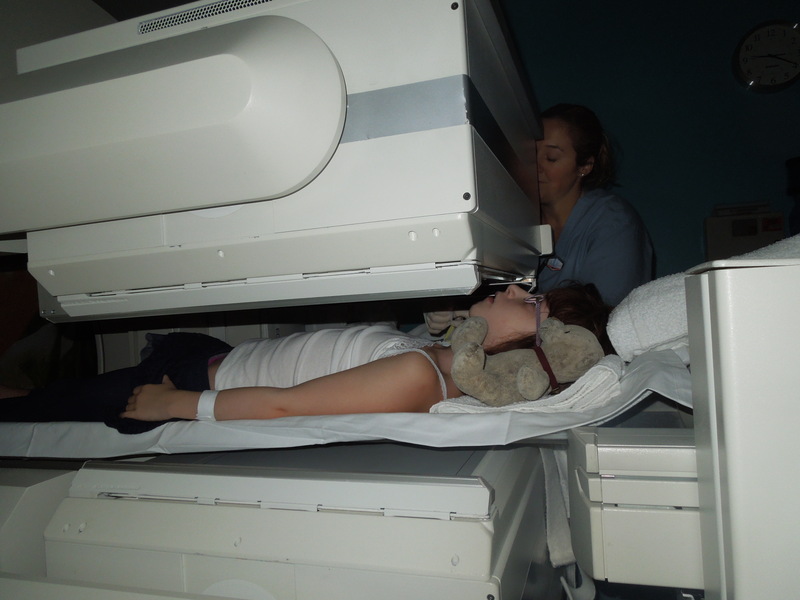 Emily, the wonderful child life specialist, and Jackie, the nuclear imaging technologist, set about explaining the test to Charlotte–the numbing of her arm, the IV and medicine, and the lying still for 45 minutes while sandwiched between two enormous cameras. Charlotte only wanted to know when they could get on with so she could start her movie (Harry Potter and the Sorcerer’s Stone). Bubba checked out the gamma ray imaging machine. He thought it was pretty comfortable. Charlotte barely noticed the IV being inserted. She was too busy playing left-handed Brave Temple Run on Emily’s iPad. 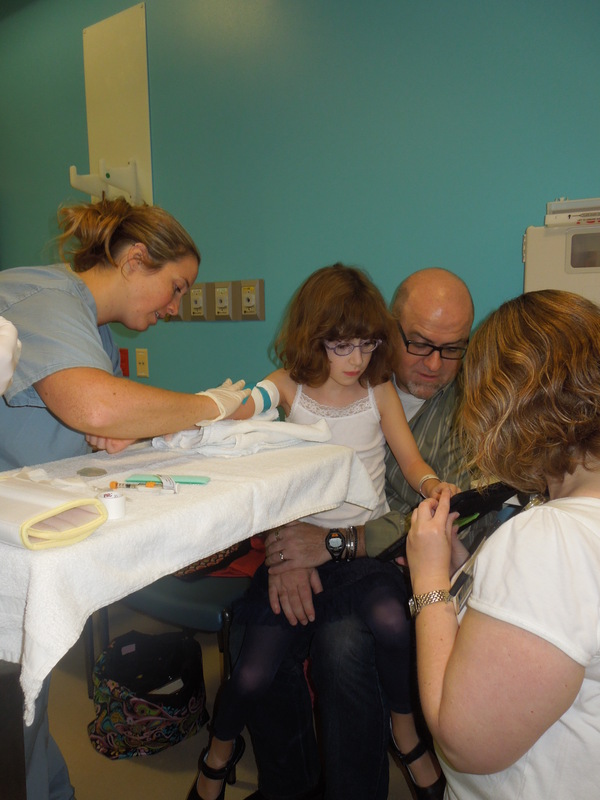 Once the worst part–the IV–was over, Charlotte was eager to get to the test. We haven’t heard the results yet. We’ll hear more about the findings when we go for the cardiac catheter next week. And if there isn’t enough going on, we move to our new house tomorrow! Charlotte is a serious trooper. Categories: Ann and Robert Lurie Children's Hospital of Chicago, cardiac catheterization, cardiology update, lung perfusion, Radiology | Tags: Cardiac catheterization, Nuclear medicine | Permalink. What is a lung perfusion test? The machine looks something like an MRI. The patient has a dye injected into their blood that allows the camera to “see” the blood as it flows through the veins. For Dr. Young this replicates by camera what the Doeppler does via soundwaves, with the added bonus of guaranteeing that she can see everything she needs to. The test takes about 45 minutes, during which time the patient needs to lie still. The 4 3/4 year old patient! Charlotte and I arrived at 9:00 a.m. Friday morning. In one of our best-ever experiences with the Radiology Department waiting room, we were called back to the Nuclear Medicine imaging room within about 10 minutes. Our technician Steph explained the procedure to Charlotte. She and Charlotte had Bubba check out the machine first. Bubba had to be reassured, Steph told Charlotte, because he might be scared. Only Charlotte could make him brave. To ease Charlotte and me through the IV procedure, Steph had Emily from the Child Life Department walk us through the numbing and needle. She brought an “IV teaching kit” and demonstrated what would happen. Then she sat with us the whole time. Our biggest trauma was that Charlotte’s vein didn’t like the “popper,” an air delivery system of Lidicaine which forces the medicine through the skin with a strong blow of air. After the “popper” the IV went in easily but there was blood in the draw back. What does that mean? When Steph pulled the needle back to check the IV placement, blood came back. For Charlotte it meant that we had to pull the first IV out and start again. She screamed, and rightly so. I blinked back tears. We both blew bubbles and watched Emily to avoid the needle. I earned a few more gray hairs! After Steph pushed the dye through the IV, she pulled the IV and Charlotte settled onto the table for the part she came for: watching 101 Dalmations (Betcha thought I was going to say Mary Poppins!). There have been some incredible process improvement since Charlotte’s last lung perfusion test June, 2006). To begin with, Nuclear Medicine has a new, beautiful room within the radiology suite. It is bright, cheerful yellow; that in itself is a major improvement over the putty gray from last time. Even better, the machine is new. Rather than the donut that Charlotte had to be slid into, the new machine features two large rectangular cameras that angle around the patient, leaving lots of open space. To get the 360 degree view, these big rectangular cameras are rotated 60 degrees every 5 minutes. In one view, Charlotte is completely visible and not penned in at all. (I’m trying to find the last post and photos of the lung perfusion; stay tuned for an update to this post with a link.) Finally, and hands down Charlotte’s favorite part, the screen the technician uses for positioning and checking the medicine doubles as a video monitor. Charlotte did tell me over lunch that she “didn’t want to do that again soon.” Who can blame her, really? But she was, as always, braver than brave. My hat off to Steph, Emily and the digital imaging student. They made this a truly painless, happy 90 minutes or so. Categories: Children's Memorial Hospital, lung perfusion, Nuclear Medicine, Radiology | Permalink.